The one arm dumbbell row is an excellent exercise for the big muscles in the back, rear of the shoulder, arms, core and lower back – a perfect exercise for helping you lose weight and sculpt your back. They could also be done with kettlebells or any other weight you can hold in your hand! If you are working out at home, you could make your own weights by re-using empty juice or laundry detergent containers and filling them with water – get creative! 3) Or placing your foot and hand on a bench. There are several different stances, but all involve the same movement of your arms: Hold the weight in your hand and let it hang straight down. You should let your arm extend to the floor enough that you feel a good stretch in your upper back. is also the same for all the stances – you should have a “flat back”, not rounded. To do this, think of sticking your chest out, pinching your shoulder blades, keeping your core tight and spine straight. Bend at the waist – not through the lower back. Pull the weight up while keeping your elbow close to your body. Bring the weight towards your lower ribs and feel the contraction in your back by squeezing your shoulder blades. Lower and repeat! One arm dumbbell rows are an awesome exercise to include in your weight loss plan. The back muscles are the largest in your upper body, which means they are a great calorie burner! They can be done by the beginner with 5lbs. or the advanced with 100 lbs. It becomes even more beneficial when done as part of circuit with other large muscle groups. Return from "One Arm Dumbbell Row" to "Back Exercises". 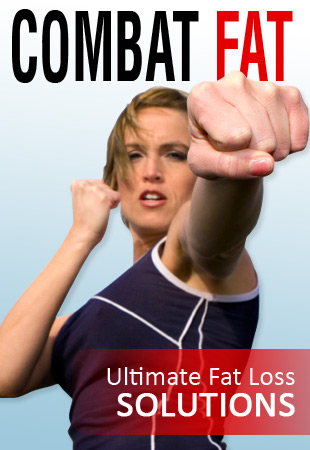 Return to Home Page of "Exercise Guide To Lose Weight".